I post here the complaint lodged with NZ’s Serious Fraud Office today 27 February 2017. 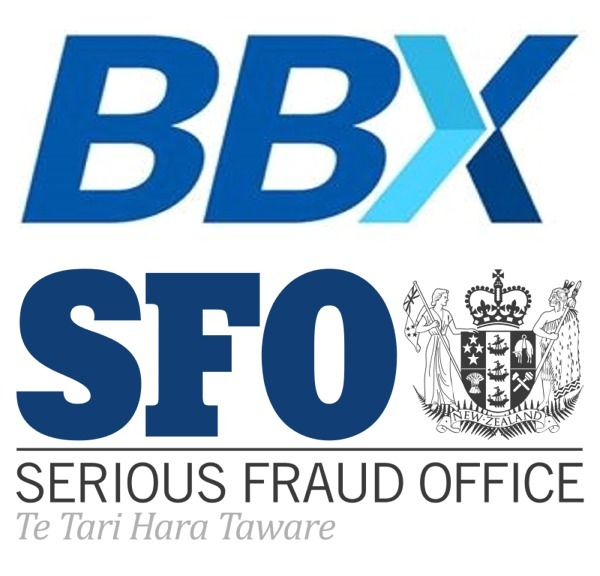 SFO handles all fraud over $2m and with my exposure of a $6.9m deficit within the BBX NZ trading platform this more than qualifies for the ‘heavies’ to get involved. Multiple crimes going back years have occurred. I have made my research available to them today. Due process will occur and the SFO in New Zealand has a strict process and protocols. They will do their work. I will help them as they so wish. The bad boys (& girls) will face justice in due course. The essence of BBX’s fraud upon the people of New Zealand is their systemic pilfering of the real goods and services from the BBX trading & barter system. Members are enticed to join and trade goods on the basis that the exchange is merely a record keeper of transactions, a third party managing inter-trading. In fact, what BBX owners (like its bigger brother, Bartercard and other owners) do is to get VERY involved with the credit that can be obtained from others’ goods, services and goodwill! Cherry picking the best goods and services for themselves; issuing huge credit lines to themselves; simply writing off those credits to conceal their crimes; leveraging credit generated at their member’s expense and all for personal gain is rife within the barter industry. With BBX on its last legs, puffing its last difficult breaths, all barter trade exchanges with inflated currencies, take note of this BBX case . . . I believe that it will draw a line in the sand. New Zealand has very clear laws over misrepresentation when conducting business which is overseen by the Commerce Commission that enforces the Fair Trading Act. While involvement of the SFO is only part of my campaign to rid the industry of a leech, it is a huge step forward for the little people – they have lost their money, all $6.9m of it for sure. What remains however is to bring the crooks to justice. I will do everything in my power to achieve this, as will I am sure others within the mechanisms of justice in New Zealand. I am an investigative blogger, a citizen of and operating from New Zealand. I have an extensive knowledge and understanding of the global barter and alternative currency sectors having investigated and exposed frauds, cons, and other misconduct in the industry, particularly over the last few years. I wish to complain about a New Zealand company, Global Barter International Limited (BBX) Company No: 3664451, a fully owned subsidiary of Hong Kong based BBX International Limited Company No: 1031854 and which is currently operated by Director Carolin MacDonald from the BBX offices in Australia. The founding Director was the late Michael Touma, (Carolin & Magali’s father), on 07 December 2011. The most recent manager is David Grant Baty – nominally still franchisee however now no longer active in the business daily. All three Directors of the company and the most recent manager are complicit in my complaint having full knowledge of the affairs of the company and the trading platform & currency. Michael Touma’s complicity is moot, of course. BBX has been operating a barter exchange in New Zealand for more than 20 years. Founded by Michael Touma, it has had pockets of success but has retrenched with membership currently sitting at 498 members on the books. It has though, by IRTA’s (the International Reciprocal Trade Association) rules only 184 active members (defined by IRTA as having traded in the preceding 12 months). My detailed investigation (The BBX Investigation) is published online and gives extensive commentary and information. I believe that the BBX Currency has been debased to 1.71c in the dollar, perhaps as low as 1.31c in the dollar and certainly no more than 4.1c in the dollar. The currency is presented by the principals to be on a par with the local NZD. This is a gross misrepresentation and at the minimum breaches the requirements of the Fair Trading Act, and s.138B of the Companies Act. Debasement of the currency has occurred progressively over the years and the BBX exchange has been deliberately mis-managed for personal gain. This is theft from the BBX Members and totals $6,952,878.04 in missing transactions calculated from un-audited membership records. This level of criminality is substantial and has had an ongoing negative effect on the victims, many of whom will never trust barter systems again due to their negative experiences. Any missing accounting records are prime facie evidence of criminal activity and breach Directorship guidelines and rules on multiple counts. That the BBX management systems can accommodate such irregularities are cause for serious concern. All three Directors knew for a long period that the BBX management system was non-PCI compliant software; that this was a huge risk to the business and that indeed a serious data breach has occurred. This is criminal negligence from Directors of a company of the first order. That it occurred offshore makes it much worse and the problems have still not been addressed. All involved at a leadership level within the company I complain about have demonstrated to me, and the BBX Members I have spoken to sufficient cause to be disqualified from being a Director in New Zealand. They have multiple companies in various stages of liquidation in both New Zealand and Australia with extensive criminal and civil matters arising from their conduct over many years. My investigation documents are available in redacted form, as I have Shield Law protection for my informants, many of whom seek and have been granted confidentiality. It is my belief that events of the last few weeks have effectively ensured the demise of the company, probably internationally, as well. So that’s it in a nutshell from New Zealand. The crimes have been committed – a barter exchange is in tatters with franchisees in all manner of death, decay, destruction and confusion. The currency is debased and the industry is in shock as a single blogger has first exposed and is then ripping the fraud to pieces in full view of the world. BBX (and Bartercard) are members of IRTA who has till today actively protected both their members from investigation and accountability. I blow my own trumpet [again]: Conman Daniel Mensi Evans and his Ormita fraud – gone! Tradeqoin, Qoin and their conmen – bankrupted for E500k and gone! BBX, a multimillion dollar bankrupted exchange – totally exposed and mortally wounded. Bartercard beware . . . I’m sure that you are watching with baited breath and you all wonder what’s coming. Your time is fast approaching too. Consumption itself is a flawed motivational platform for a society. Repeated consummation of desire, without moderating constraints, only serves to habituate people and diminish the future satisfaction potential of what is consumed.